Back when Hillary Clinton and Obama were having their tete-a-tete in the Democratic Convention, we put our vote on Barack. A black grouper appeared on the scene. A predator, large enough to eat any tomtate, sergeant major, french grunt, or juvenile bream watched us while food was given out, apparently for free, with no visible strings attached (pun intended). The moment he swallowed food thrown by my hand, he was hooked (metaphorically of course). Then it was only a matter of time for the stress, anxiety, and novelty of a new way of eating to wear off, for Barrack to allow fondling manipulation, and photo ops. We are talking about the fish now. We enjoyed the dignified company and silky soft skin (groupers have comparatively small scales), of an amazing grouper. Black, and other groupers can change their skin hues according to mood, intent, and environment. The black-brown squares that line his outside result in a Ninja ability to hide in plain view, but in the shade. I invite past divers who enjoyed his company to relish the memory. An autumn brush past of a hurricane took him, either to the ‘other side’, or out on adventures in the deep. I look forward to seeing another grouper, who may choose to be our friend. 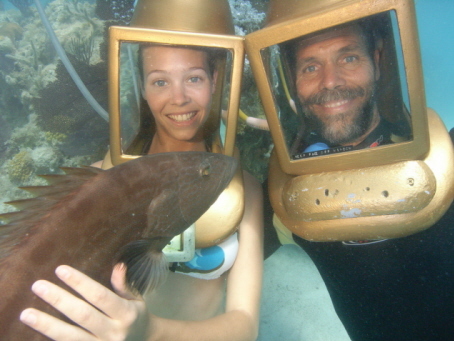 Never since the 70’s was any member of the grouper family on good terms with any human. Back then we Hartleys had a tame Nassau grouper at Stag Rocks reef, off Shelly Bay. I must dig for photos.